Known for his hauling abilities, intelligence and gentle ways, St. Bernard is a gentle giant. Who seems to have sixth sense about impending dangers and beneath this powerful body lies a heart of gold…he can be your true companion…for life. S t. Bernard are also called Saint Dogs, Noble Steeds, Alpenmastiff, or Barry Dogs while in some parts of North America, they’re also popularly known as “Saints” and true to their name, they are saints in all aspects. They are the gentlest of all breeds of dogs. A St. Bernard was originally bred for rescue and working dog. 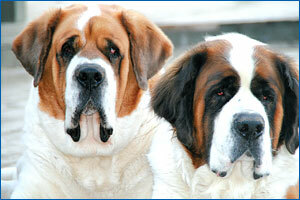 There are two varieties of the St Bernard: short-haired (smooth coat) and long-haired (rough coat). “Both varieties are of notable size and have a balanced, sturdy, muscular body with imposing head and alert facial expression,” tells Vishal Sethi.They are powerful, strong and muscular … with the most intelligent expression. Their head is strong and imposing. The skin of their forehead forms noticeable wrinkles. Their muzzle is short, nose is broad and ears are set high. But their eyes are fascinating…dark brown, mediumsized with friendly and intelligent expression. Their tail is broad and powerful but ends in a powerful tip.Their coat is dense but smooth. They are found in many colours like splash, mantle or broken mantle, (white, black, with a primary third colour ranging from light brown to orange to red to mahogany). A full-grown male can weigh between 72.5-110 kg and the approximate height is 27.5-35.5 inches. Friendly disposition… gentle giants They are very loyal , affectionate and gentle. As per Carol Beck, if properly trained and socialized, St. Bernard are very people oriented, friendly, snugglers/leaners. “They need human touch and are very affectionate. Lazy but very smart, they are the true gentle giants,” she says. “They are easy to keep, they just want to sleep at your feet,” tells Carol. But she advises that they are not for neat freaks as they shed lots of hair and drool. Even though they are protectors due to size but they are not watch dogs. They will lead the robbers to the family silver. 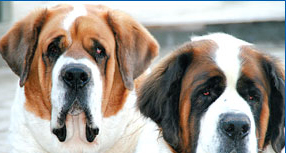 The St. Bernard is one of the gentle giants of the canine world. They are docile and are good around children (who are old enough to handle the Saint’s size), and though they aren’t overly playful, they are sweet and affectionate and like to be around their people. They love children and seem to know the ones with whom they need to be gentle, like toddlers or frail youngsters or children with disabilities. Puppies need to be watched with children under three as they can be accidentally knocked down. Children should not be allowed to terrorize, poke eyes or ears and especially ride them like a horse. Parent supervision is extremely important with any dog. “Definitely they have an understanding of a child’s way and are amazingly careful not to injure a child. They are excellent babysitters and companions,” adds Vishal. Vishal advises to get your puppy vaccinated and dewormed regularly. “Since the Saint is prone to bloat, feed him 2-3 meals a day. Whenever you take him out for a walk, keep him on a leash. Do not over- exercise your puppy as he is slow-moving and his bones are forming,” advises Vishal. Saints can have a stubborn streak, so puppy training classes are recommended for every St. Bernard. So, SOCIALIZE, SOCIALIZE, SOCIALIZE. A well socialized, properly trained St. Bernard is a joyous companion. “Expose a puppy to all sorts of experiences, sights, sounds, people, and places. Whatever is not acceptable at 150 lbs cannot be allowed as a puppy,” advises Carol. “Since they are very eager to please and respond well to positive, consistent training, training them will not be a problem. Infact, you won’t have a better friend than your Saint,” tells Vishal. “Puppies need to have a lot of playtime; all exercise should be natural and not forced. Daily walks and fun interaction with their humans is essential. They’re dogs who love to romp and play but NOT dogs who enjoy long daily hikes (as a Lab or Golden Retriever might). They don’t have the high activity level of a Jack Russell terrier, nor do they need the constant, intense mental stimulation of a Border Collie. They’re ready to go with you at all times but if you’re just waiting around, a Saint will sleep until you’re ready to go,” tells Carol. Grooming a St. Bernard is not any different than other dogs. They need frequent brushing, combing, nail trimming, and ear cleaning and bathing as necessary. They shed a lot of hair, especially when they “blow” their coats. It will be minimized if they are groomed daily. Clean your St. Bernard’s eyes frequently with a moist cotton-wool pad. Be sure to use a new one for each eye. “Depending on the weather, the level of excitement, and the shape of the dog’s jowls, most Saints will drool on occasion,” adds Vishal. “The dog will do well as long as there is a cool dry place to nap and plenty of fresh cool water. It must be remembered that going from an air conditioned place into the heat can be disastrous. Abrupt changes in temperature are extremely hard on a Saint,” warns Vishal. They basically enjoy sleeping and eating as adults. Each dog is different but some like to play ball, gnawing on a hard rubber chew toy, carrying around a stuffed toy in their mouths, swimming (while others despise water). Most enjoy carting, weight pulling and training in Obedience work. “I really don’t know if they enjoy the training or the fact that they are with their human and want to please. They are very much a people dog,” adds Carol. Canine hip dysplasia, epilepsy, entropion, cardiac disorders and we’re seeing a lot of cancer. “In short, the Saint Bernard is a magnificent, wonderful breed. Let one into your heart and you’ll be hooked for life,” concludes Carol.